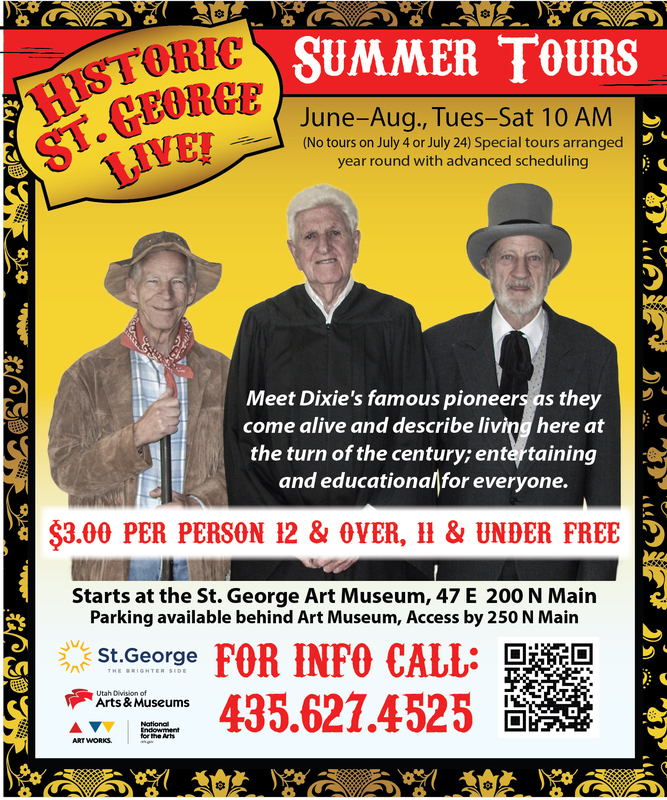 Visitors to St. George and residents too will meet Brigham Young, Erastus Snow, Orson Pratt, Jacob Hamblin, Judge John Menzies Macfarlane and a woman pioneer this summer as part of the Historic St. George LIVE! tours. Beginning June 1 and ending August 31, 2017, guests will meet the pioneer settlers in historic buildings around town. Five days a week, Tuesdays through Saturdays, at 10 a.m., the tours will start at the Art Museum at the Pioneer Center for the Arts, 47 East 200 North, across from the St. George Post Office. Added this year are cotton spinners and a player of an Indian flute starting at 9:45 a.m.
Tickets can be purchased at the St. George Art Museum: They are $3 for ages 12 and up; children are free with an adult. Each ticket is also good for one admission to the St. George Art Museum.